Many locals know Great Woods (or the many names it has had since opening) as a concert venue. What many don’t know is that there is in fact an area of dense great woods to the west and north of the venue. Today, finally after two failed previous attempts, I made my way into Great Woods. I was also joined by a rookie hiker for this walk. We started the hike from a parking area at the sharp bend in Oak Street. We first made our way down the narrow orange trail through a field and then along the edge of the woods. The trail then turned into the woods as it widened a bit. The woods were covered in areas with dense green ferns. The trails here are clear and well maintained. The are a little root bound and muddy in places but easy to navigate nonetheless. We followed the orange trail to its end then turned left onto the red trail. We then turned right onto the green trail passing a sign calling off the Codding Farm site. 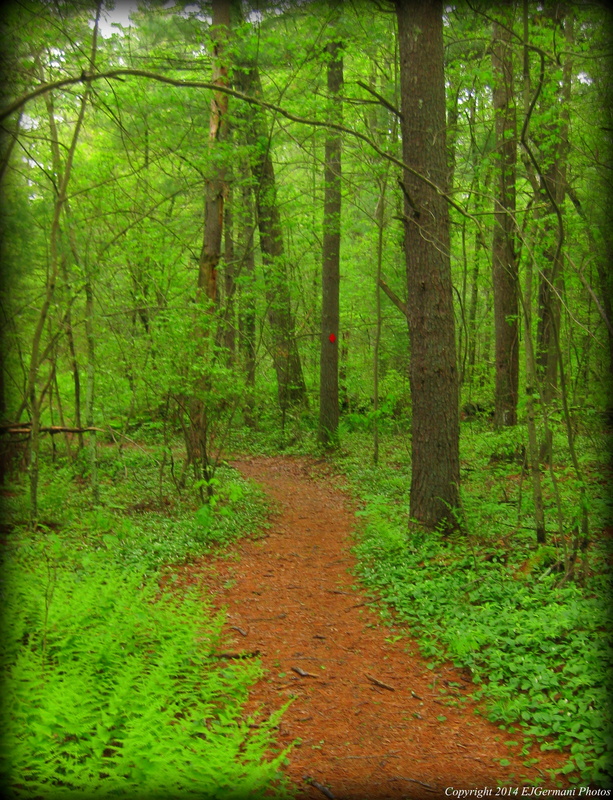 We followed the green trail to its end passing several lady slippers that are in bloom. I had seen some earlier in the week in Rehoboth as well. The green trail ends at the Massachusetts Bay Transit Authority’s railroad tracks. Do not cross the tracks. We happened to come out to the railroad tracks just as the Acela train was coming by. I’m not sure how fast it was actually going on this stretch of tracks between Providence and Boston, but it is known to travel at speeds of 150 miles per hour. It certainly seemed that it was going at least 100 miles per hour or faster when it went by. After being blown away (almost literally) by the train, we turned around and made our way back into nature retracing our steps back down the green trail. At the red trail we turned right and followed that back to the parking lot. We did not come across any wildlife other than birds here and the sounds of frogs. We also saw some stone walls and old abandoned farming equipment. Trail map can be found at: Great Woods.